One downside to traveling is that it is harder to stick with any sort of exercise regimen. Whereas at home, I can step away from, say, the computer to push some weights on the power rack in the basement for a nice break, usually while I’m on the road, I lack such convenient access to exercise equipment. Therefore, after a couple weeks of traveling, it’s not unusual for me to feel like my muscles are wasting away. 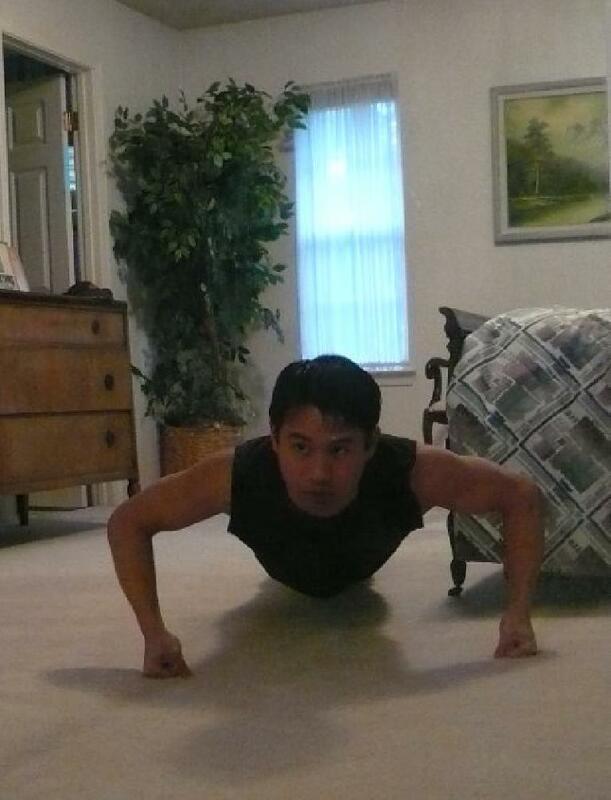 Pushups: I try to do one or two sets of 50 a day on my knuckles, which allows me to go deeper. Wall sits: It seems like just doing a two-minute wall sit already burns out my quads! Quite humbling for a cyclist. Of course, whenever I visit Stacey, she always seems to make me do 20-30 pullups. And Alyssa is good about making me rock climb. Does anyone have any other exercises they’d recommend adding to this regimen? One nice thing about all of the above is that it takes less than 10 minutes! I’m also a fan of the bodyweight squat — there are so many variations you can do. Both legs is pretty easy, but tossing in a lateral leg raise at the top of the movement makes things more interesting. You can do them out to the side, too. There are a couple of one leg variations, as well — the pistol and Bulgarian squat. If you have some room, you can do walking lunges. And if you want to do something plyometric, there’s always the alternating split squat jump. For the posterior chain, hamstring bridging is straightforward, and there are variations on that as well (both legs, one leg, bicycling one leg, taking one leg out to the side). Single-leg deadlifts will also work the hip extensors, and are a good stability exercise, as well. There’s a lot you can do to vary your pushups, too. The pushup plus, where at the top of the movement, you pull the shoulder blades apart, is great for developing shoulder stability. You can do tricep pushups, as well as vary the positions of your hands. Moving into a side plank at the top of the movement is another variation. Oh, and I’ll have to show you what I call the twisty-body pushup. I don’t know what it’s actually called, but I found a picture of a woman doing it online somewhere, and I thought the movement ROCKED. Oh, and what about handstand pushups? 😉 If you can’t do those (I know I can’t! ), there’s a downward dog variation called turbo dog that you can do instead. And if you’re doing pushups, you may as well be doing dips, too. The only thing that seems to be missing is rowing-type movements, but I can’t think of a “portable” way to do them. Abs — obliques! 🙂 I can show you some Pilates mat exercises as well. Hi Felix! I really find these Harbinger resistance bands to be a big help while I’m travelling, or days I’m not swimming. Pretty good complement for swimming, actually. They’re pretty inexpensive ($10-15 each) and don’t take up room in my luggage like a set of weights would! I’ve got 2 each “medium” and “heavy”, in full-length and “figure 8”. After trying a bunch, I’ve found that I prefer the Harbingers by far. You can get them via the Internet, but I just saw them at Sports Basement in Sunnyvale last Sunday!